These example sentences are selected automatically from various online news sources to reflect current usage of the word 'revenue.' Views expressed in the examples do not represent the opinion of Merriam-Webster or its editors. Send us feedback. Revenue, also called sales (or turnover, in the UK), refers to the value of the products and services a company sells. Net revenue usually refers to a company's sales net of discounts and returns. Let's assume grocery store XYZ sold $100,000 worth of food for the year. 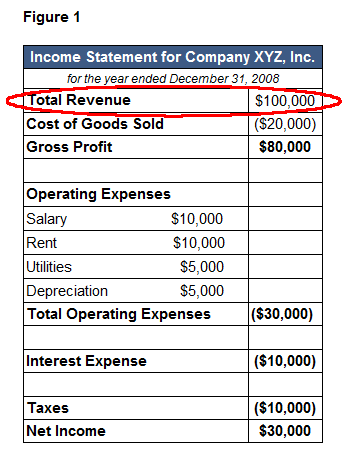 It would record these sales as revenue on the very top of its income statement (as shown below). Revenue is a measure of how much raw income a company is bringing in from sales of its products and services. A company that sees its revenue rise every year signals that a company is selling more of its products and services which can help it grow. Falling revenues each year signal that a company is faltering or shrinking. Generally, the more revenue a company brings in the more money a company has to work with to pay expenses and make a profit. Generally accepted accounting principles (GAAP) and industry standards often determine when a company can record revenue. For example, if a wholesaler sells a product for $10,000, does it record the sale when it receives the order, when it ships the product a week later, or when it receives payment from the buyer a month after that? Revenue recognition standards answer these questions, which vary by industry and type of sale. You can usually learn what a company’s revenue recognition policies are in the notes to its financial statements. What made you want to look up revenue? Please tell us where you read or heard it (including the quote, if possible).